Remarks: Atef is alleged to be Usama Bin Laden’s second in command of the terrorist organization, Al-Qaeda. 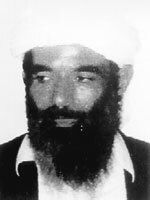 Muhammad Atef has been indicted for his alleged involvement with the August 7, 1998, bombings of the United States Embassies in Dar es Salaam, Tanzania, and Nairobi, Kenya. The Rewards For Justice Program, United States Department of State, is offering a reward of up to $25 million for information leading directly to the apprehension or conviction of Muhammad Atef.